Williams Brothers' Curtiss C-46 remains the only injection-molded Commando to 1:72 scale. And anyone who's tackled the kit knows how challenging it is. 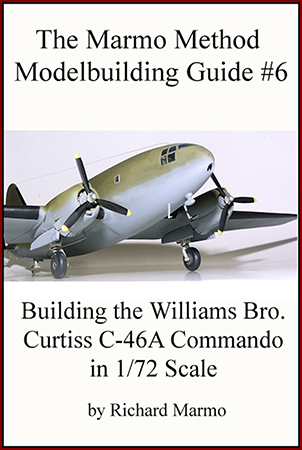 Fortunately, Richard Marmo shows how in his illustrated E-Book, Building The Williams Bros. 1/72 scale Curtiss C-46A Commando – sixth in the author's growing range of printable, privately produced "Marmo Method Modelbuilding Guides". Marmo doesn't just build the model: he improves it with aftermarket and scratch-built elements. Pity Maestro Models' beautifully detailed, pre-painted brass instrument panel is barely visible inside the completed kit cockpit – and the fragile photoetch seat mounts remain completely invisible! He thankfully covers each construction stage – notably the model's hideous wing-root gaps and airfoil discrepancies – with commendable clarity. But I really think an inside shot of the "Smaller pieces of .020" styrene" is necessary, for instance, to show how "to cover the vee shaped gaps" in his upgrade to open cowl flaps. Some enthusiasts might also question Marmo's choice of ModelMaster Olive Drab ANA 613 and Neutral Gray FS36270 for period Curtiss camouflage matches. But maybe he simply grabbed what he had – as many modelers do. In fact, Marmo admits to using "a 35 or 40 year old bottle" of Pactra M-1 Flat Scale Black to airbrush tires. Over 130 color photos illustrate the 89-page effort. And a list of "Links" nicely concludes coverage. Williams Brothers' 1:72 Commando remains one tough, toilsome transport. But Marmo steadily smooths your way. "With time, this e-book and patience, mostly patience," he concludes, "the end result is a quality C-46 that you'll be proud to add to your display case." And that's well worth his modest $3.99 price of admission. My sincere thanks to Scale Publications for this review sample!